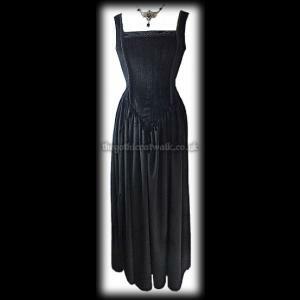 A gothic medieval full length dress made from black stretch velvet and with a classic square neckline edged with twisted cord. 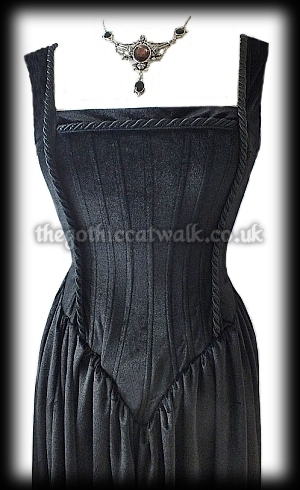 The bodice of the dress has a V shaped panel with seven narrowly space bones with each side being edged with twisted cord which extends onto the wide shoulder straps. 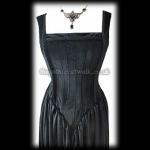 The skirt section is gathered onto the V of the bodice forming a gathered effect. The back of the dress has a zip fastening. This dress can be worn with long length gloves for an elegant effect or with a fishnet or mesh top underneath for a more contemporary look. Bust: 32" unstretched Waist: 26" unstretched Length: 58"
Bust: 34" unstretched Waist: 28" unstretched Length: 58"
Bust: 36" unstretched Waist: 30" unstretched Length: 58"
Bust: 38" unstretched Waist: 32" unstretched Length: 58"